Heel Pain In The Morning - What Causes It? Heel Pain In The Morning – What Causes It? Heel pain can be very distressing for the person suffering from it. There are several reasons for heel pain in the morning. At times it can be a symptom of conditions related to the foot. Your doctor will analyze the symptoms and can diagnose the exact reason for your pain. The most common condition for back of heel pain in adults is Plantar fasciitis (swelling of thick connective issue on the bottom of the foot that connects heel to toe). With age this connective tissue loses its elasticity and becomes susceptible to injury. When the fat padding on the heel becomes thinner, it can no longer serve as a shock absorber properly which may result in the damage of the plantar connective tissue. – wearing proper fitted shoes with heel padding. Another common condition associated with heel pain in the morning in adults is Achilles tendonitis. When the Achilles tendon (tissue that connects calf muscles to the heel) becomes stiff, it can get injured and become swollen. 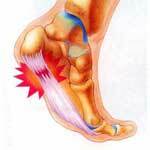 This puts pressure on the heel and result in heel pain. Applying ice packs and performing Achilles tendon stretches can relieve the pain. In case of severe pain, consult your doctor. The most common cause of heel pain in children is Sever’s disease which occurs during growth spurts in children in the early puberty stages. Severe physical activities such as jumping, running and gymnastics can increase the pain. Sports, fractures, repeated stress on the heel, poorly cushioned shoes and obesity can be a few reasons for the condition. Heel pain in the morning in children differs from that in adults. Pain in children can get progressively worse with physical activity. Heel pain in the morning can also be due to common causes such as sore feet from running on hard surfaces, tightness in calf muscles, heel injury from landing on the heel awkwardly, sudden turning of the heel, etc.